ItemH-04017 - Astrophysical Observatory, Little Saanich Mountain, During Construction. ItemH-04018 - Dominion Astrophysical Observatory, Little Saanich Mountain; Polar Axis Of Telescope In Place, Declivation Axis And Housing Being Attached. ItemH-04019 - Dominion Astrophysical Observatory, Little Saanich Mountain. Polar Axis Of Telescope. ItemH-04023 - Astrophysical Observatory, Interior View. ItemH-04037 - The Union Bank at NE corner of Government and View; Central Building beside it to the right. At the left, Trounce Alley and W & J Wilson. ItemNA-39536 - Main Street, Barkerville; St. Saviour's Church At The End Of The Street. ItemNA-39840 - St. Paul's Naval Chapel, Esquimalt. ItemNA-39841 - St. Paul's Naval Chapel, Esquimalt. Item H-04037 - The Union Bank at NE corner of Government and View; Central Building beside it to the right. At the left, Trounce Alley and W & J Wilson. 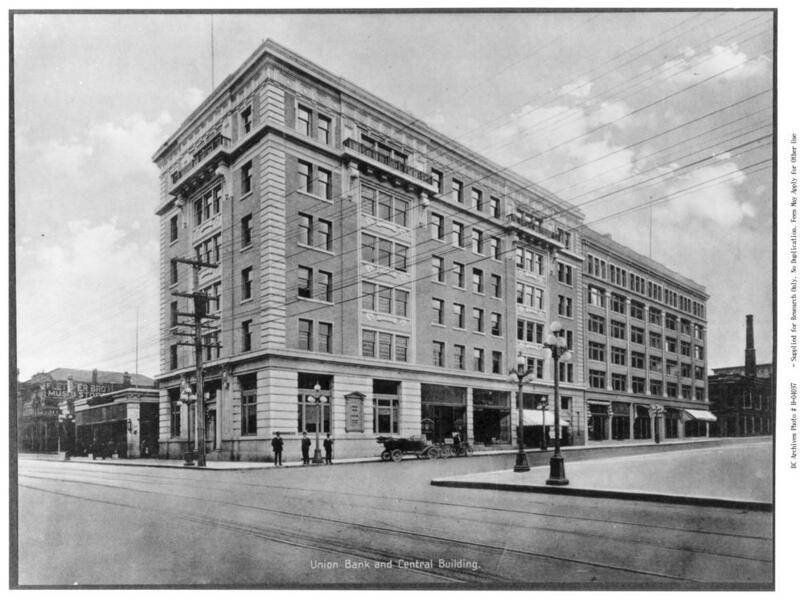 The Union Bank at NE corner of Government and View; Central Building beside it to the right. At the left, Trounce Alley and W & J Wilson.